As a part of their role as the eponymously named charity’s official watch partner, Oris has launched a special edition watch commemorating Movember, with a portion of the sales being donated to the Movember Foundation. Founded in 2003, the Movember Foundation encourages men to grow moustaches every November to raise money in support of the 1,200 health projects it runs around the world. During this current Movember, Oris will host a series of fundraising events across European cities, including shavedowns, poetry slams, Movember walks and an auction of an Oris Movember Edition. 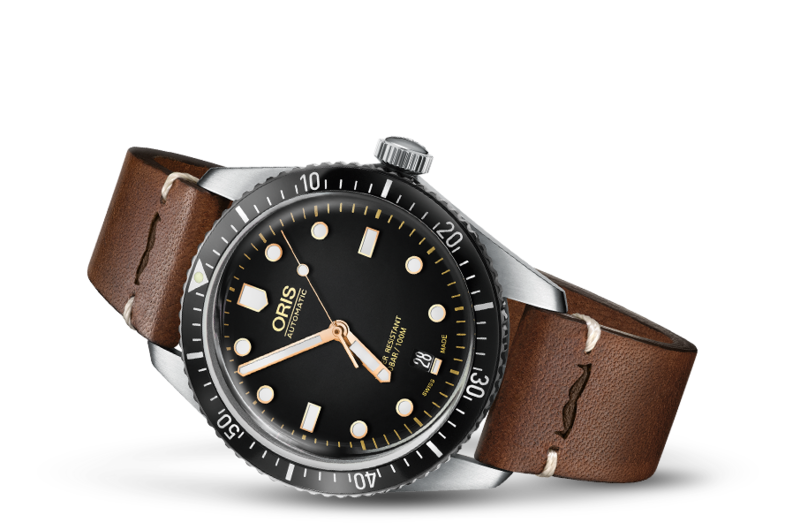 The watch is based on Oris’ Divers Sixty-Five, of which there are now over two dozen variants. For those unfamiliar with the core specifications of the Sixty-Five on which this is based, the Movember watch has a 40mm stainless steel case which has a uni-directional rotating bezel with black aluminium inlay with 60-minute timer and zero marker filled with Super-LumiNova. It has an AR-coated bubble-curved sapphire crystal and it is water resistant to 100m. The dial is black, curved, and has rose gold plated hour, minute and seconds hand filled with Super-LumiNova. The indices are applied, also featuring rose gold plating, and also with Super-LumiNova. So what are the Movember nods on the watch? The most prominent one is on the back where ‘Oris Movember Edition’ and the moustache logo appear alongside the Oris logo. Said logo is also heat-stamped twice onto the brown leather strap. Inside is the automatic Oris Calibre 733 (base movement Sellita SW 200-1) with a power reserve of 38 hours. This special model comes in a heritage box with a vibrantly hued NATO and a more subdued dark brown leather NATO that features the Movember logo on the metal loop. The RRP is CHF 2,100. It’s a social media type of world we live in, so if you want to see what Oris are doing during this month, check the hashtags #OrisMovember and #Orischangeforthebetter. Hi. If you want to use my post then yes I would appreciate a link back to my original. As for what sort of donation by Oris, a proceeds of each watch sold. In a general sense, people who take part ask for sponsors to grow a moustache in the name of charity.